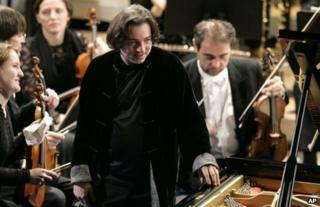 World-famous Turkish pianist Fazil Say has appeared in court in Istanbul charged with inciting hatred and insulting the values of Muslims. He is being prosecuted over Twitter posts mocking Muslims, in a case which has rekindled concern about religious influence in the country. Mr Say, who denies the charges, said recently he was "amazed" at having to appear before judges. Rejecting an acquittal call, the court adjourned the case until 18 February. Prosecutors brought the charges against Mr Say in June. He faces a maximum sentence of 18 months in prison although correspondents say any sentence is likely to be suspended. The indictment against him cites some tweets, including a retweet by Mr Say which says: "I am not sure if you have also realised it, but if there's a louse, a non-entity, a lowlife, a thief or a fool, it's always an Allah-ist." Dozens of the pianist's supporters gathered outside the courthouse with banners, one of which called on the ruling Islamist-based AK Party to "leave the artists alone". Mr Say has played with the New York Philharmonic, the Berlin Symphony Orchestra and others, and has served as a cultural ambassador for the EU. Egemen Bagis, Turkey's minister in charge of relations with the EU, suggested the case against him should be dismissed, saying the court should regard his tweets as being within "his right to babble". However, Mr Bagis also criticised the pianist for "insulting people's faith and values". Correction 5 November 2012:We have changed the text to make clear that the quoted tweet was actually a retweet, and to amend the translation.